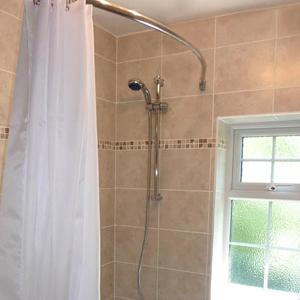 Curved Shower Curtain Rails give you up to 25% more space when you shower. The beauty of Byretech's Curved Shower Rails is that they can be cut to size and fitted together easily to give you the exact size you need for your unique bathroom. We use the absolute best grade 1" or 25.4mm Stainless Steel and multi point fixings, so absolutely no rust or tarnishing with Byretech Shower Rails and that's guaranteed. At Byretech, we design, manufacture and supply a wide range of top quality cut to size Stainless Steel Shower Rails. If you see our images elsewhere online, you know it's a Quality Byretech product and won't sag or rust like the cheaper imitations you can find now on the internet. We now also offer an amazing range of Chrome Plated Brass Shower Curtain Rails which suit the more traditional bathroom and are ceiling mounted. Easy to fit, zero maintenance and all of our Curved Shower Rails carry a fantastic no rust guarantee.